Late last year, a landslide in Northern India sent enough debris into the Tsarap River, creating an obstruction about 2,000 feet (600 meters) long, and a brand new 300-acre lake. Authorities in Jammu and Kashmir are now concerned that this dam could lead to damaging floods. The landslide occurred sometime around December 31, 2014. 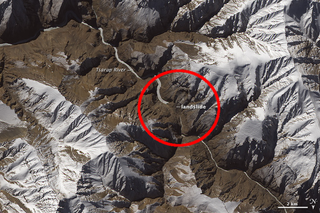 Detailed satellite imagery taken by the Indian Space Research Organization's CartoSat-2 shows that a new lake has formed behind the obstruction downstream. It measures nearly 5 miles (8 km) long and covers about 300 acres (55 hectares). The dam itself is estimated to be about 200 feet (60 meters) high. The Operational Land Imager (OLI) on Landsat 8 acquired this image of landslide debris and the barrier lake on January 18, 2015. An image of the same area on December 4, 2014, is shown for comparison. Notice that the river appears wider upstream of the landslide. The river also appears brighter after the landslide because the surface has frozen and a fresh coat of snow coats the ice. Note that the images have been rotated to minimize relief inversion, an optical illusion that can make it difficult to tell the difference between valleys and ridges. After surveying the situation on January 18, a team of civilian and military engineers recommended that people who live downstream move to higher ground. They also discouraged authorities from using explosives to clear the blockage as doing so could trigger additional landslides. While the chance of a catastrophic flood is lower with the lake frozen, the risk will increase when temperatures rise in the spring. As a precautionary measure, authorities have closed the Chadar ice trek, a popular route that involves hiking on frozen river ice downstream of the blockage. It's difficult to know how serious the hazard is, but local authorities aren't taking any chances.